The Ertz family enjoyed a memorable Sunday. Julie Ertz scored a goal for the reigning World Cup champion United States women's soccer team in a 5-1 win over Denmark in San Diego. After the game, she found out her husband, Philadelphia Eagles tight end Zach Erth, is headed to his first Super Bowl. With the U.S. women playing at the same time Eagles were opposing the Minnesota Vikings in the NFC Championship Game, Julie Ertz was unaware of the result from Philadelphia until after her game ended. 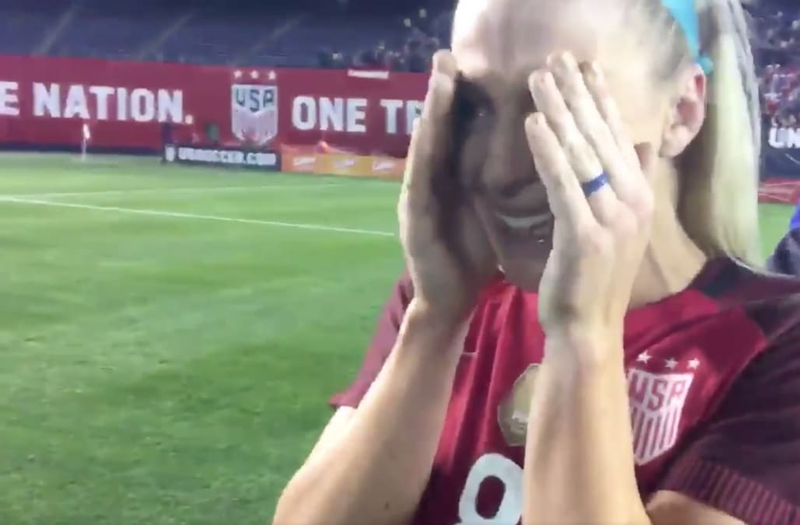 When she heard the football result, she burst into tears of joy on the field. "I am so excited. Go Birds!" she subsequently said in an ESPN interview. "(Zach and I) were texting right until the last second we could text. I tried not to look at halftime, but people gave me the smile as if they knew something. But I couldn't wait for the whistle ... and they told me, and then I had to make sure from like 10 people that (the Eagles) are going (to the Super Bowl), and I am so excited." Zach Ertz made a team-high eight receptions for 93 yards in the Eagles' 38-7 rout of the Vikings. After his win, a reporter showed him a video of his wife's excited response to the Eagles' victory. "It's emotional for me," he said. "I wish she was here, obviously. Tough not having her here, but I can't wait for her to get home to celebrate with us." Julie Ertz knocked in what proved to be the game-winner for Team USA against the European Championship runner-up Danes. After conceding the opening goal to Denmark's Nadia Nadim in the 14th minute, the U.S. team tied the game on an Alex Morgan goal off a Mallory Pugh assist in the 17th minute. Just two minutes later, Ertz scored on a short shot off a header from Tierna Davidson, who was making her national team debut. A minute after halftime, Pugh stole the ball just past the center circle, drove one-on-one against a defender and powered a 16-yard short into the top right corner for a 3-1 lead. Pugh repeated the feat in the 65th minute. She again picked off a wayward Denmark pass in the United States' attacking half, made quick work of one defender thanks to a stepover, then rolled the ball home from just to the right of the penalty spot. Crystal Dunn capped the scoring when she knocked in a rebound in the 81st minute. The U.S. players were coming off a two-week preseason camp in Los Angeles. Team USA is building up to October, when it will participate in the CONCACAF qualifying tournament for the 2019 World Cup in France.